Chances are pretty good that you have a Richard Scarry book or two in your collection—more than 100 million of his books have been sold. In honor of what would have been his 97th birthday today, here are a few facts about the man behind Busytown. 1. HE DREW MAPS FOR THE ARMY. After being drafted into the army during World War II, Scarry was assigned a job repairing radios. It didn't go well. He was relocated to a job that would make better use of his talents, and ended up spending several years drawing maps, illustrating propaganda, and creating promotional signs. When Captain Scarry was discharged, he went to New York to pursue a career as a commercial artist. 2. SCARRY GOT A JOB AT VOGUE—AND WAS PROMPTLY FIRED. He quickly landed a dream job: a position in the art department at Vogue magazine. He was only there for two or three weeks before he told he was the "wrong fit" for the job and was let go. 3. IT WASN'T LONG BEFORE HE WAS DRAWING FOR LITTLE GOLDEN BOOKS. The first was 1950's The Animals Merry Christmas, written by Kathryn Jackson, and it wouldn't be the last. Among the many titles Scarry illustrated for Little Golden Books was Jane Werner's Smokey the Bear, released in 1955. Scarry's depiction of the little cub in a ranger hat cemented Smokey's status as an icon. 4. HE COLLABORATED WITH WIFE PATSY SCARRY ON SEVERAL BOOKS. Patricia Murphy was writing children's textbooks when she met Scarry. After they married, she used her talent for understanding how children read and learn to write several books for him under the name Patsy Scarry. Some of their joint titles include the Little Golden Books Good Night, Little Bear and The Bunny Book. 5. AT ONE POINT, EIGHT OF THE 50 BEST-SELLING CHILDREN'S BOOKS OF ALL TIME WERE RICHARD SCARRY BOOKS. The New York Times reported that in 1989, a Publisher's Weekly list showed that eight of the top 50 best-selling hardcover books belonged to Scarry. This 1996 list ranks Richard Scarry's Best Word Book Ever at #18, with 3,798,953 copies sold. Richard Scarry's Best Mother Goose Ever followed at #38, I Am a Bunny at #41, and Richard Scarry's Best Storybook Ever at #46. 6. HIS BOOKS HAVE GONE THROUGH SUBTLE BUT SIGNIFICANT CHANGES OVER THE YEARS. If you read Best Word Book Ever as a child, and have since purchased a new copy for your own children or grandchildren, keep your eyes peeled for some cultural changes. Stereotypical visual references to "Indians" were removed, both moms and dads are shown preparing meals in the kitchen, and males and females are shown doing jobs that defy dated gender roles. They also removed labels such as "beautiful screaming lady" (being rescued by a male firefighter) and "pretty stewardess." Alan Taylor discovered these differences (and many more) and has posted the before-and-afters. 7. 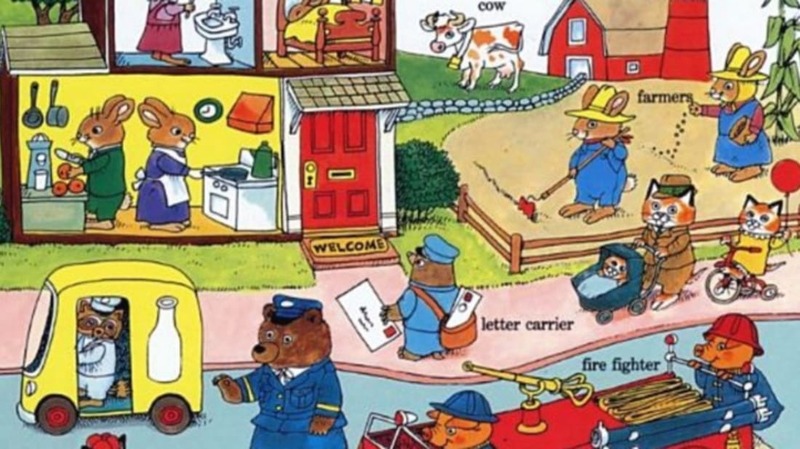 THERE ARE MORE THAN 1400 OBJECTS IN RICHARD SCARRY'S BEST WORD BOOK EVER. First released in 1963, the book is crammed with a staggering number of things for inquisitive children to discover. "Children like funny situations, detail and lots of action," Scarry once told an interviewer. "Nothing delights me more than to see a child reading a well-worn copy of one of my books held together with tape." 8. SCARRY'S FAMILY IS REPRESENTED IN HIS BOOKS. The character "Huckle Cat" is named for Scarry's son, Richard Scarry Jr. The illustrator deemed his son "Huck" at a young age after deciding that he looked like "a real Huckleberry Finn." Huck's daughter, Olympia, says that she and her sister are also depicted in her grandfather's books. 9. HUCK SCARRY PICKED UP WHERE HIS FATHER LEFT OFF. When he was just a teen, Huck helped his father illustrate scenes in the Busytown books, filling in colors for Cars, Trucks and Things That Go. Instead of coloring one scene at a time, their method was to color all of the reds in the entire book, then the yellows, then the oranges, and so on. Huck continued the Busytown series after Scarry passed away from a heart attack in 1994. 10. LOWLY WORM WASN'T SUPPOSED TO BE A STAR. The little invertebrate wasn't intended to be a main character, but children absolutely loved him. “He was just a little thing kids could look for,” Huck Scarry told Niagara This Week in 2012. “But he started getting fan mail and drawings from kids.” Scarry gave the kids what they wanted: more Lowly. 11. A NEW LOWLY BOOK WAS RELEASED IN 2014. Huck discovered sketches and an outline for a new book more than a decade after his father's death. Already well-versed in the Scarry style of illustration, Huck was able to complete The Best Lowly Worm Book, publishing it in 2014—and there could be more to come. "The University of Connecticut holds most of my father's original artwork, including sketches," he told Entertainment Weekly in 2013. "I am currently looking at whether there might be something complete which might be brought to a finished book. We'll see!" 12. GRANDDAUGHTER OLYMPIA SCARRY IS ALSO AN ARTIST. Olympia Scarry has followed in the artistic footsteps of her father and grandfather, but on a slightly different path. Though she specializes in nature installations and performance art, Scarry doesn't entirely rule out illustrating children's books someday: "You never know, maybe I will. My father would love that."